Type location Guinea (Euponera (Mesoponera) nimba) Mt. Nimba, Camp IV, 1000 m, single worker collected by Lamotte, 2.vi.1942; Bernard, 1952: 190, worker, illustrated; in Pachycondyla Bolton, 1995: 307; new placement by Schmidt & Shattuck, 2014: 111). 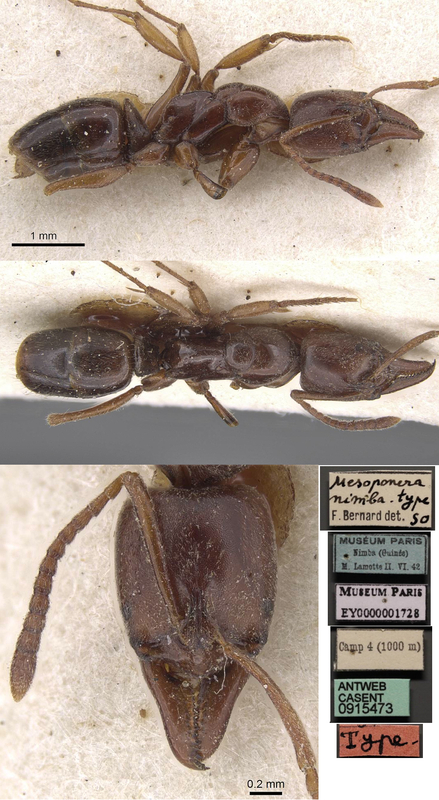 Sole known specimen, although a single dealated queen, locality not given, seemed likely to be of this species. .
WORKER (modified from Bernard) TL 6.6 mm, HL 1.22, HW 1.0 mm. Almost entirely dark red, shiny, darker on the propodeum and last segments of gaster; tarsi and scapes paler. Dorsum of thorax shiny with fine puncturations; pleuron and sides of abdomen very smooth, without puncturations. Fine yellowish hairs throughout, except on the head. Colouration and size of eyes indicate a greater tendency towards a subterranean form (slender and less darkly coloured) than previously described Mesoponera from Africa. Head somewhat elongated. Mandibles slender, shiny, with finely spaced points, 13 small, black, spaced out teeth, terminal 3 smaller. Clypeus convex, depressed apically, terminating in a prominent point. Antennae slender, scapes extending past the rear of the head, by about 1/6 of their length. First three funicular segments subequal, twice as long as wide, following segments shorter. Eyes black and flat, around 60 facets (150-250 for Mesoponera). Pronotum very globose; propodeum (epinotum) straight, declivity much longer than anterior face, concave and limited on the sides by large shining rims, without carinae. Petiole scale thin and high, like other Mesoponera/Xiphopelta. Note: On Antweb this is listed as Pachycondyla neonimba. This is attributed to Özdikimen (2010 - see http://www.munisentzool.org/yayin/vol5/suppl/986-1000.pdf) who trawled through the nomenclature looking for preoccupied names. He suggested "Pachycondyla silvestrii nimba" is a valid prior name. 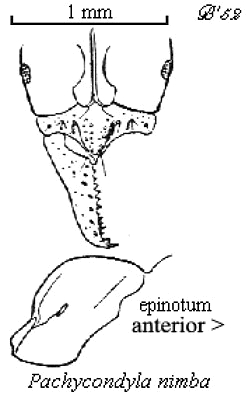 Bernard's use (1952: was Bothroponera silvestrii Sant., race nimba n. subsp. The apparent homonymy stems from Bolton (1995: 307) where, as with many other species, it appears annotated "Combination in Pachycondyla: Brown, new combination". Brown, however, died without any such paper being published and, arguably, it is Bolton's note that is invalid. Schmidt & Shattuck (2014) do not mention this but nullify the need for renaming.